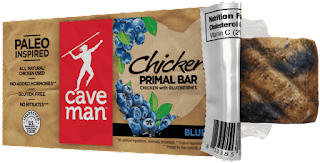 Caveman Foods makes Paleo-inspired snacks to help keep your body going at its primal best. Inspired by our ancestors’ way of eating, and founded on the principle that having convenient snacks doesn’t mean sacrificing nutrition, or taste, our products are made with the highest quality ingredients and packed with incredible flavor. 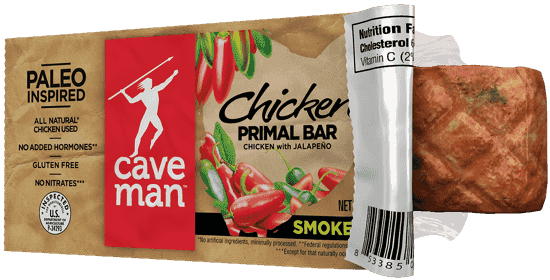 So, every time you bite into a Caveman Foods snack, you know you’re doing something good for your body and your mind. Paleo-inspired is all about the nutrient-packed food your body was designed to eat: nuts, seeds, fruit, vegetables and lean meats. 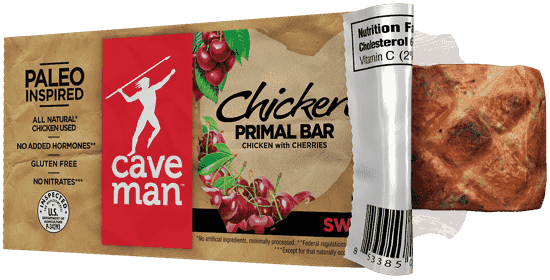 Caveman Nutrition Bars, Chicken Jerky and Chicken Primal Bars are perfect for everyone, from professional athletes to those just striving to live a balanced, active lifestyle. 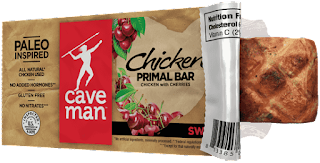 Whatever’s keeping you on-the-go, Caveman Foods will help you stay on the right track. From the days of the caveman, this is what we’re meant to eat. Chris Running, founder of Caveman Foods, started Caveman Foods because he loved the idea of making honest, great tasting and good-for-you products based on the concept of "what we're meant to eat". This core idea of eating what our bodies were originally designed to eat made sense to Chris and has had a profound effect on his body and mind. As a life-long swimmer, fitness buff and champion of building exciting new brands (such as Muscle Milk), Caveman Foods' products represent a culmination of experience reflecting Chris' unwavering commitment to delivering you a superior product, great taste, and a promise that you're doing something good for yourself every time you eat a Caveman product. In spare time, Chris enjoys swimming in Lake Tahoe, kayaking, paddle boarding and taking long walks with his wife Rebecca and dog Wally…and sipping on the occasional margarita. A dreamy trio of coconut, almonds and dark chocolate, this bar tastes like your favorite candy bar but delivers the nutrition your body needs for optimal energy. Cherries, cranberries, and decadent dark chocolate make this bar devilishly good, but far from sinful. Nuts, sea salt and a drizzle of smooth dark chocolate, this sweet and salty bar is bliss in every bite. Your taste buds will go wild over this delicious melody of blueberries, nuts and apples. Sweet and spicy, juicy and tender, it’s hard to believe our Chipotle Honey Caveman Jerky™ is gluten-free, low in fat and calories, and packed with 12g of protein per serving. Fiery bold flavors with a kick in every bite. A unique and flavorful fusion of tangy blueberries and robust spices. The perfect pairing of succulent sweet cherries with a subtle smoky finish. Caveman Foods Paleo-inspired snacks are so delicious! Caveman Nutrition Bars are incredibly filling and the perfect amount of sweet and saltiness. These are the perfect quick and filling snack to keep you fueled throughout the day. 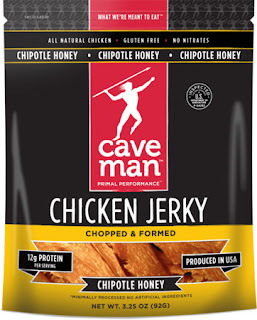 Caveman Foods Chipotle Honey Chicken Jerky is so good! I'm going to just admit right now that I ate the entire bag in one day. 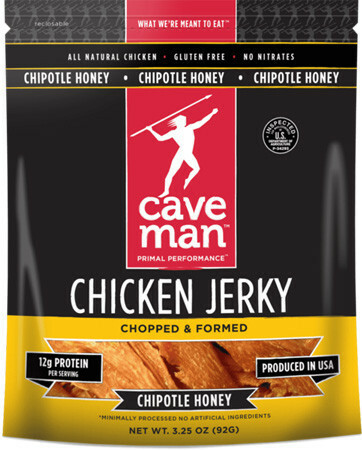 I love that Caveman Foods Chipotle Honey Chicken Jerky is gluten free and a wonderful protein snack. 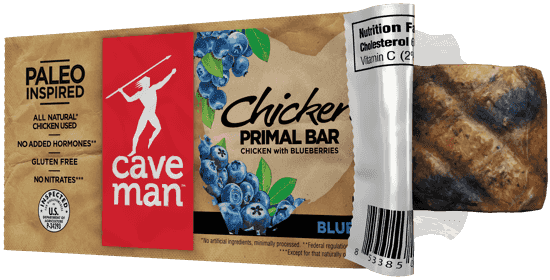 Caveman Chicken Primal Bars were something that I wasn't sure I'd really like but boy were they good! Such incredible flavor! I highly recommend you all try Caveman Foods Paleo-inspired snacks! I promise you won't be disappointed! Click HERE to find a store near you that sells Caveman Foods! 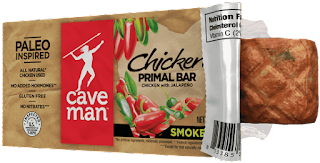 Click HERE to learn more about Caveman Foods! Follow Caveman Foods on social media!